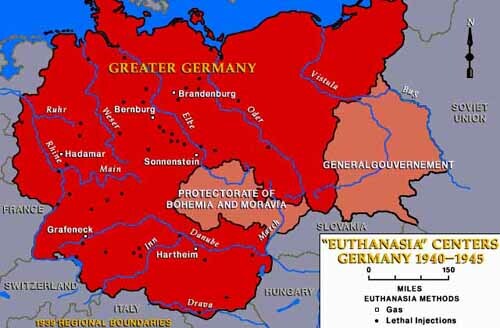 In the fall of 1939 the German government established, under the Reich Chancellery, the Euthanasie Programme under the direction of Philip Bouhler and Dr. Karl Brandt. The headquarters of the operation were at Tiergartenstrasse 4, Berlin and the code name for the program was derived from that addressT-4. The choice of terminology for the program is consistent with the Nazis' penchant for euphemism. Euthanasia typically means "mercy killing" and in the 1990's in the United States and other western nations, it is synonymous with "physician-assisted suicide." The kind of killing carried out through the T-4 program bears little resemblance to contemporary concepts of euthanasia. Hitler's rise to power produced a completely new set of definitions. Guided by the over-riding principles of racial hygiene, racial purity, and national health, the Nazi regime seems fairly consistently committed to the removal of those unfit to live and produce inferior offspring. In 1935, the Nuremberg Laws provided for the forced sterilization of the unfit. Not only did Hitler have in mind such "inferior races" as Jews and Gypsies, he also included unfit Aryansthe mentally defective, severely handicapped, the incurably insane and the incurably sick. Of the number of people killed in the T4 and the 14f13 projects, the following statistics are usually given: adult mental patients from institutions, 80,000 to 100,000; children in institutions, 5,000; special action against Jews in institutions, 1,000; concentration camp inmates transported to killing centers (14f13), 20,000 (Klee estimated that at the end of 1941, some 93,521 `beds' had been emptied for other uses [70,000 patients gassed, plus over 20,000 dead through starvation and medication] - in other words approximately one-third of the places for the mentally ill.) But these figures may well be too low; twice these numbers of people may have perished. The fact is that we do not know and shall probably never know. Elements of deception, imposed chaos, and the destruction of many records make anything like an accurate estimate impossible. The same is true concerning the total number of people murdered at specific killing centers. Hartheim victims of both ordinary `euthanasia' and 14f13 are variously estimated from 20,000 (by Dr. Georg Renno, Lonauer's successor as director), to 400,000 (by Franz Ziereis, the former commandant of Mauthausen, on his deathbed); 30,000 is believed to be the best estimate. While these figures may seem unimpressive when placed next to the millions killed in the Final Solution, they represent the murder of shockingly large numbers of peopleall in places characterized as hospitals." (The Nazi Doctors: Medical Killing and the Psychology of Genocide. London: Papermac, 1986 (Reprinted 1990) p. 142). "Concurrent with the start-up of the euthanasia exterminations, Hitler authorized Himmler to establish a Race and Resettlement Office under the aegis of the SS. It was the Race and Resettlement Office that was to be responsible for the `racial' purification of the Reich and the establishment of a Nordic empire. On October 17, 1939, Keitel summoned the victorious Wehrmacht generals for a lecture from the Fu"hrer, who ranted: `The increased severity of the racial struggle permits of no legal restrictions. Jews, Poles, and similar trash are to be cleared from the old and new Reich territories.' Eight million Poles and 800,000 Jews were to be transported from the annexed portion of Poland into the government-general, and replaced by ethnic Germans repatriated from the Baltic lands, the Balkans, Russia, and the Italian Tyroleven though, in large part, these Germans had emigrated generations before. To `render harmless' the Polish intelligensia, political and religious leaders, Jews, and anyone else who might, theoretically, rally an opposition, Heydrich established SS Einsatzgruppen (action groups). The Einsatzgruppen rampaged over the land, terrorizing and killing. Selections for execution were haphazard. Sometimes the commandos erred and included ethnic Germans whom they mistook for Jews. Shootings were carried out publicly to heighten the climate of fear. A Werhmacht intelligence officer reported: `Arrests were almost always accompanied by looting. Evacuations were carried out and blocks of houses were cleared at random, the inhabitants loaded into lorries at night, then taken to concentration camps. Actions against the Jews were carried out with the most serious excesses. A number of Jews were driven into a synagogue, where they had to crawl, singing, between the benches. Forced to take down their trousers, they were continuously whipped by the SS men on their bare behinds. A Jew who out of fright dirtied himself was forced to smear the excrement onto the faces of the other Jews. `After about fifty Jews, who had been used during the day to repair a bridge, finished their work in the evening, two SS men drove them into a synagogue and shot them all without any reason.' (Judgement At Nuremberg, New York: Harper & Row, 1983, pp 211-212. 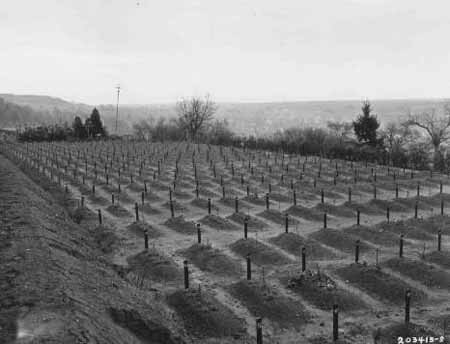 The euthanasia program proved to be a valuable precursor to the atrocities which were to come in connection with the "Final Solution." 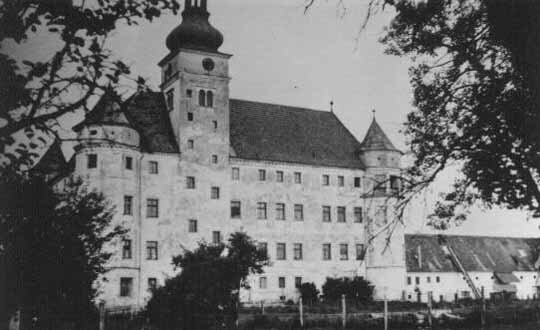 SS Major Christian Wirth was transferred from his duties at a euthanasia center to take over the supervision of Chelmno, the first of six extermination camps in Poland to become operational. His expertise in mass extermination seems to have been a major consideration. Wirth later served at Belzec, Treblinka and Sobibor. In 1940, Franz Stangl was transferred from one of the euthanasia centers to Sobibor extermination camp where he served as camp commander. He performed so well there that he was transferred in the summer of 1942 to Treblinka [Many years later, in 1970, Stangl was extradited from Brazil to West Germany to stand trial. He was found guilty of joint responsibility for the murder of 900,000 Jews]. After the Wannsee Conference in 1942, the staff of Euthanasia Program was transferred to Operation Reinhard.